I'm sure that I'm not the only parent who is trying to fix all their problems at once. It feels natural to want to be the best role model for your children that you can be, but naturally it is also extremely difficult. I find that it's hard to avoid being frustrated when you're lacking sleep, juggling a crying baby with...anything (they don't exactly understand, or care, that you need to clean, or sleep, or eat). We moved from Sydney to Newcastle, about three hours' drive from where we used to live, because we found it difficult to find a rental property in Sydney where we could keep our dog, have a vegetable garden and a backyard for Indigo to play in that was slightly more affordable. At first it was isolating to move so far from friends (but a relief to get away from family - we've had quite a few dramas with our families, and other than a few individuals they have been particularly unhelpful since Indigo was born), but now we've made some new friends, and living in Newcastle is seeming like less of a punishment for not being able to afford to buy a house! We'd really like to move back to Sydney and find somewhere in Katoomba or something, not too far from our family and friends, where we can grow veggies and keep chickens. It's a bit of a pipe dream, considering that we need to save money and get everything nice and stable so things will be good for Indigo, but it's a nice dream for sometime down the track, when we can afford to own our own mortgage. I think I need to focus on the good things about here and now, because even though we're a bit isolated from old friends, we're making new friends too. we have been fortunate enough to get to spend LOTS of family time together, Due to neither Dave or I being able to find work in the area yet. Make sure when you move that you're not moving to a city with extremely high unemployment rates unless you're relocating for your job. I know I've taken time off to have a kid, which is apparently a big no-no, but I've never had problems finding work before, and it's getting ridiculous. I'm hoping that one day, I can make a living out of my writing, but until then, it'd be nice for us both to find something that gets me out of the house and gives Dave a chance to spend some one-on-one time with Indy. 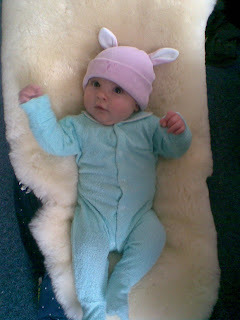 Indigo at 2 months old in her rabbit hat. I can't believe she's grown so fast! I'm also looking into going back to uni, and studying early childhood/primary teaching, mainly with the aim of understanding my own kid better. I want to know what makes little minds tick, so hopefully I can squeeze part-time study into my schedule somewhere. I'm sure all the stress and time I spend jamming productivity into small spaces of time now will pay off down the track, when I reap the benefits, but can gloss over how hard it was to get there.